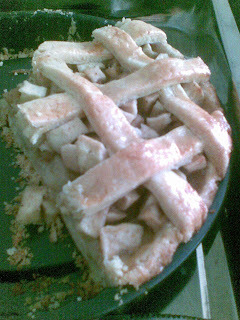 Made American Apple Pie yesterday. After the Lemon Tart episode, was itching to make another pie :D but pies have loads of fat content :( might not bake another one till next year or two. Taken with Nokia 6300. It doesn't have the macro function so there's no way I can get pictures anymore clearer than the above (they're on the verge of getting blurer too). The pie is baked in a 9-inch flan pan (it's written "pie pan" but since the bottom juts out, I googled and found out its a flan pan). Soft texture and delicious apples inside. 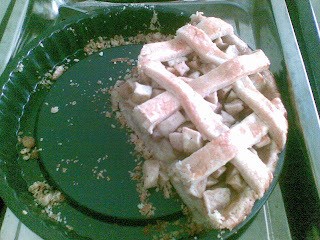 I haven't made apple pie in years! Must start again!